Boost Sales & Customer Loyalty. The fastest way to grow your Chick-fil-A with the leader in Text Messaging.Textboom offers a cutting edge platform and the best pricing in the industry. 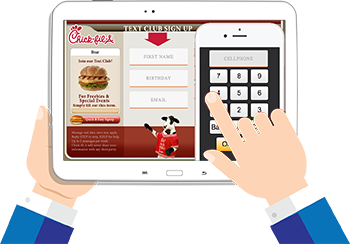 Chick-fil-A owner/operators nationwide and each year we help more businesses grow with SMS marketing. Regardless of business size or budget, text messaging promotions can help you grow your franchise. You get a marketing team with 9 years of experience that will work with you to ensure your success. Never worry about your list being out-of-date. We constantly monitor your list to make sure your numbers are good. In addition, we have staff dedicated to your restaurant to assist in ALL aspects of your mobile campaigns. When it comes to text message promotions for your business, Textboom offers you the best service to price ratio on the market. See why we are the best here. We only offer true "Express" text messages. Some competitors charge up to $25 for keywords. Make as many sublists as you'd like without any additional cost. You can have as many subscribers as you'd like, you still only pay for the messages that you use. Inbound messages and system messages do not count towards your plan usage. Our platform offers the latest features available. Contact us 24/7/365 via phone, email, text, live chat - If we are not available immediately, we will always respond in a timely manner to assist you. Our platform integrates with Facebook and Twitter, making it even easier to manage your promotions and social media presence. Send automatic "Happy Birthday" texts to your customers, customized with a special offer from your business. Create "text-to-win" contests to reward your customers and build your marketing lists. Our web widget wizard makes it simple to create opt-in forms for your website - Just copy and paste! Our "Message Box" feature allows you to instantly reply to individual customer responses and even start a chat session if they have further questions. Our media manager allows you to upload images and other media for use in your text message promotions. 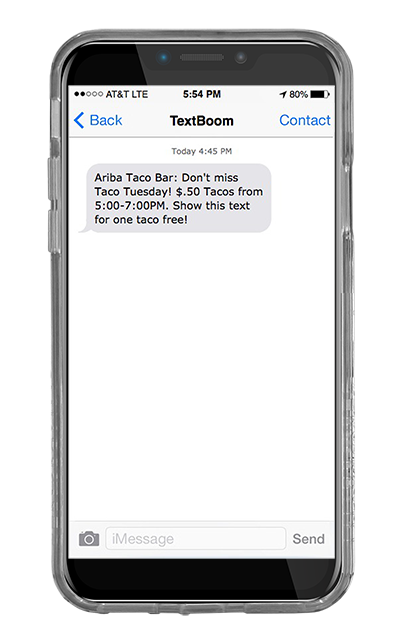 A Textboom Exclusive: Get a FREE mobile tablet, stand and custom designed mobile app to promote more customer signups and feedback from your customers!